Shameeza Mohammed and her husband in happier times. 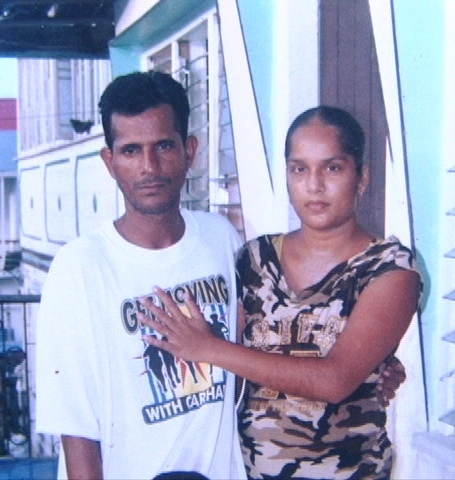 A 27 – year – old mother of three was rushed to the Georgetown Public Hospital Corporation (GPHC) last night [Tuesday August 20] after she was stabbed repeatedly by her husband. The incident occurred around 8:00h at Cummings Lodge, Georgetown. According to the GPHC, the woman sustained stab wounds to her chest and trauma to the face. iNews understands that the woman and her husband had an argument and she decided that she was taking her children and moving to her mother’s place in West Ruimveldt. According to reports, she then went to take a bath and when she was in her bedroom putting on her clothing, the man entered the bedroom and began stabbing her in the region of the chest with a knife. Reports indicate that the woman and the man have been living together for some 14 years. The man is said to have fled the scene.